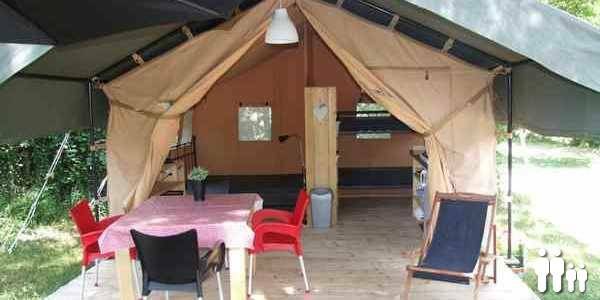 For the “amateur glampers” among us, campsite La Champagne offers you three comfortable Safari Tents, one on each level of the campsite. This is where you can make a booking for one of the 3 safari tents on Camping La Champagne. Safari Tents are rented from Saturday to Saturday. In case this poses a problem for you, please contact us through info@campinglachampagne.eu before actually making your booking. We will try and find a way outside of these days if possible. Please remember to bring your own sheets and pillowcases! If you happen to have any specials requests (such as a babybed, etc) then you can indicate this under the section “Comments” in the booking menu. We would like to be the first ones to wish you very happy Holidays! If you would like to have another quick look at the page where we describe and show the tents, please click here.